I arranged a visit with the owner of this property and it was clearly visible that this garden had been neglected for many years. Myself and the client discussed many ideas and designs for this garden, they was looking for something low maintenance, child friendly and somewhere to relax and enjoy those summer evenings. On day 1 the task was to completely clear the site and remove all the old fencing. Once this was done we began by installing new fences around the perimeter of the garden using concrete posts, gravel boards and closeboard panels. Day 4 We then began laying our foundations for a small patio area and a small concrete base for a small shed for storage. It was then time to lay our new Indian sandstone patio and build a small 6×4 shed. At this stage the garden was starting to take shape, we brought in new top soil for the new lawn which was then laid in a light/dark green formation. We cut out a couple flower beds on the left hand side for planting and adding more colour to the garden. We then moved up to the small alleyway for access to the garden, We laid a Geotextile membrane to stop any weeds and foliage growing back, the client wanted small slabs bedded down to create a stepping stone effect leading to the main garden, between all slabs we distributed 20mm plum slate chippings between the stones to give the path way a fuller and complete look. 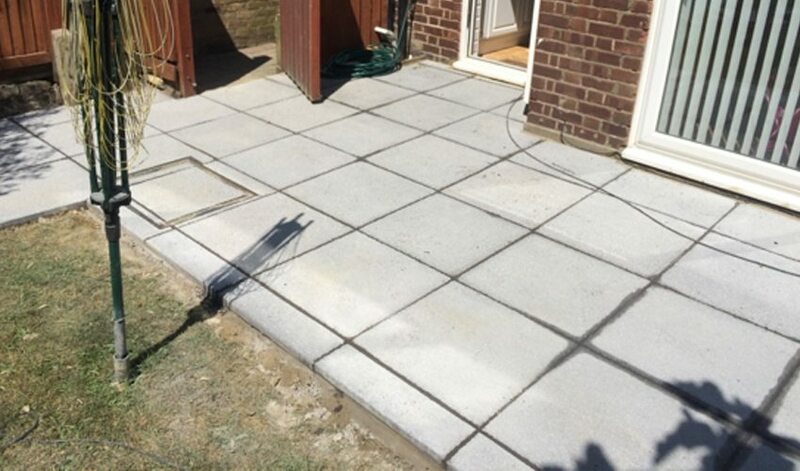 This project was completed in 9 days overall, this garden was transformed from a unusable, neglected, derelict space to a modern, contemporary, stylish garden. The client was very happy with the results. 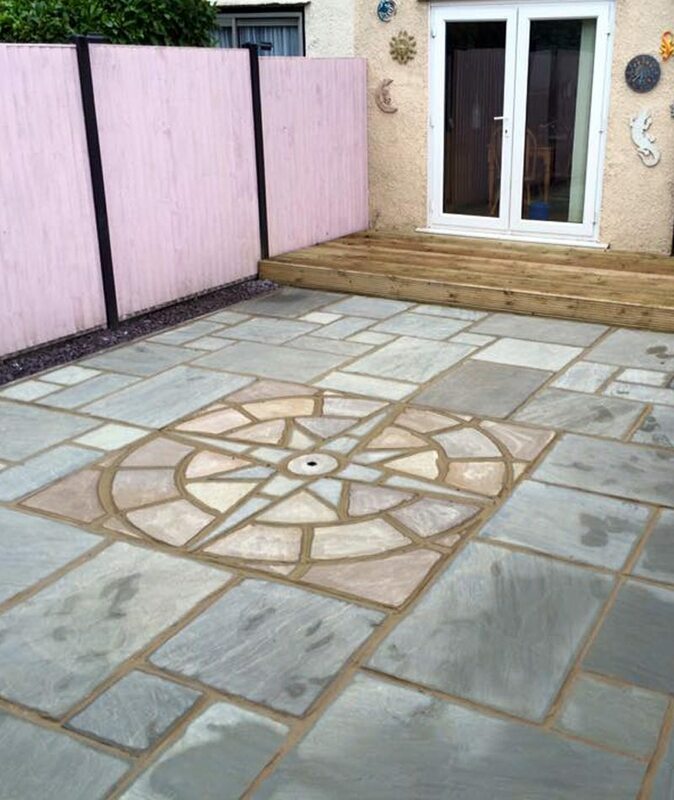 For this Project the customer was renovating the entire property so was on a tight budget and was a case of giving this garden a small makeover for an easy sale. We put up a low fence along the boundary to divide the two front gardens and cut back all the overgrown hedges. We laid a new path up to the porch area using 450mm x 450mm peak riven grey slabs. We then sheeted out the entire garden with a weed membrane and applied 10mm shingle. The Client was very pleased with the makeover. Our Client wanted to replace there old looking path and patio. 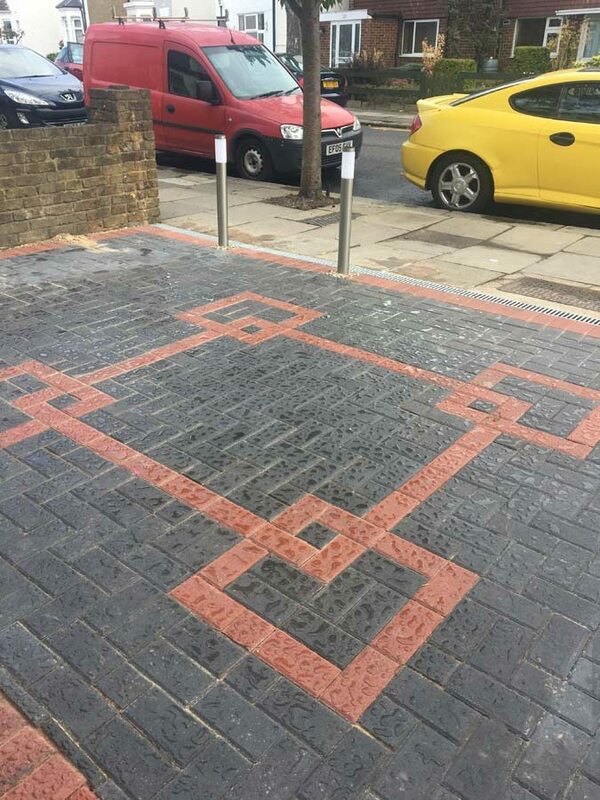 We began by breaking out all the old crazy paving slabs over the entire perimeter for our foundations, We also removed the old manhole cover for a more traditional Recessed tray which we can lay our new slabs in. Total area coverage for this project was 28m2. 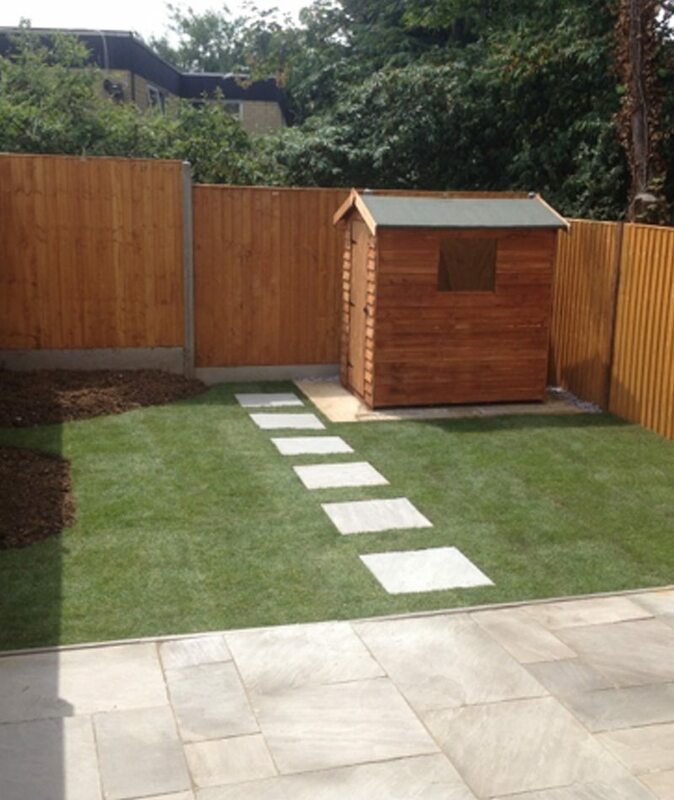 This project gave our clients garden a much brighter, stylysh and modern look on completion. Our client decided to get rid of their high maintenance front garden for a new driveway. We excavated the entire front garden to the required depths ready for the new foundations. Once all the hedges were taken down this exposed next doors garden so we built a new 9″ wall and pier with new wall copings. All drainage channels were laid for excess rainwater. A retaining soldier course was laid around the perimeter in a charcoal block paver. 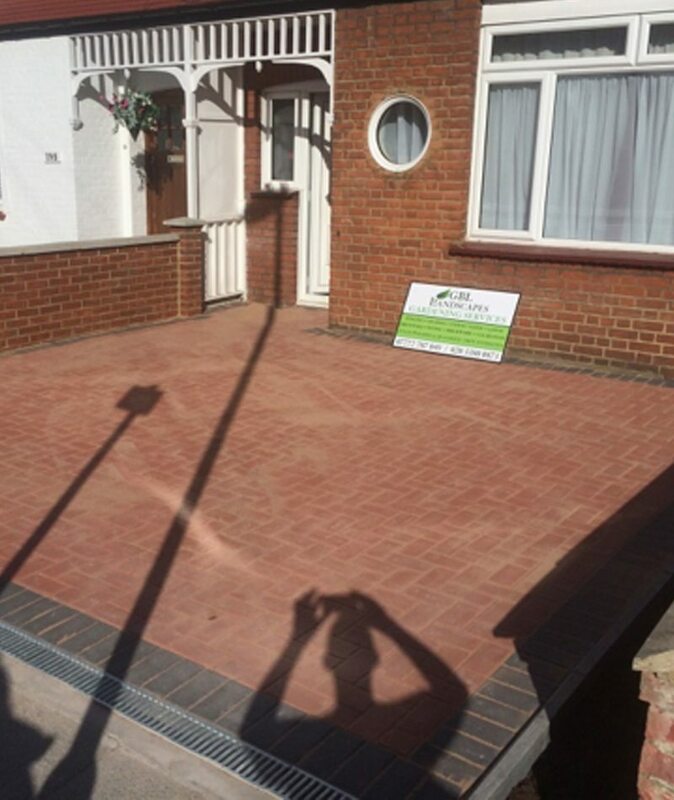 Once the screed bed was laid it was ready for the block pavers to be laid in a 45 degree herringbone pattern. 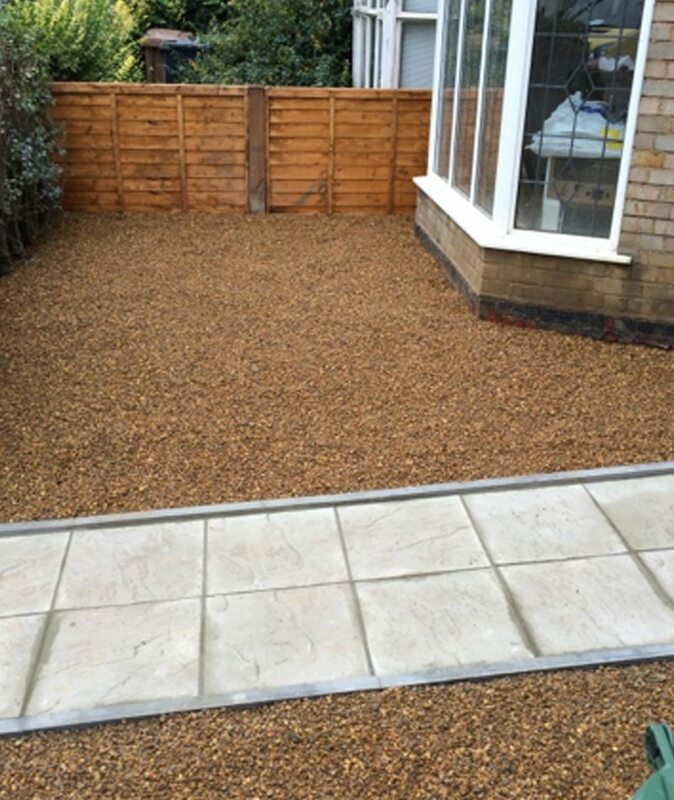 The Customer was very happy with the results of their new driveway requiring no maintenance and easy access to and from their vehicle, also not having to worry about parking any longer. The existing access into this client’s garden had become a hazard and particularly dangerous due to the large drop off from the back door to the level of the main garden. 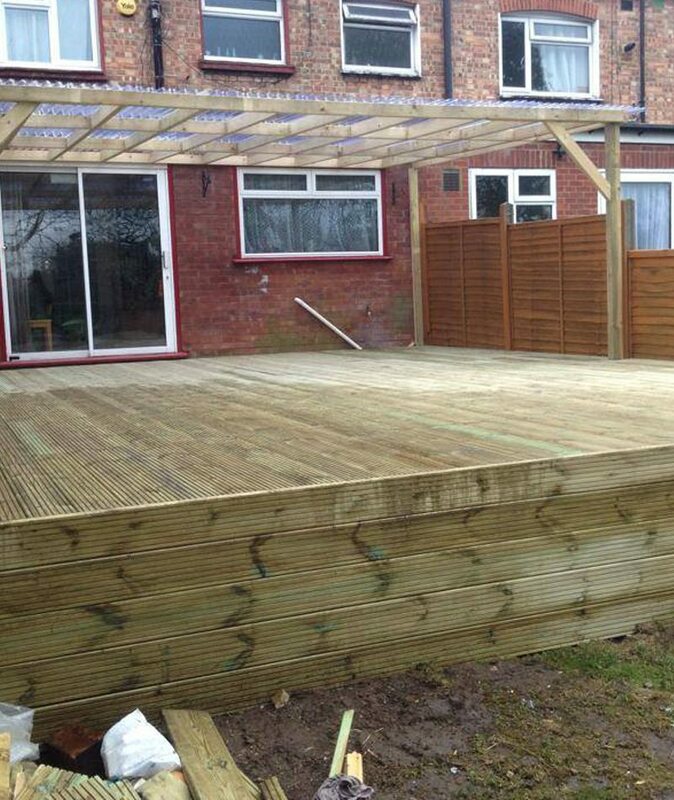 We decided to go for a decking area for easy access out the back door and onto a area for a table and chairs, this area is a great size for entertaining family and friends. 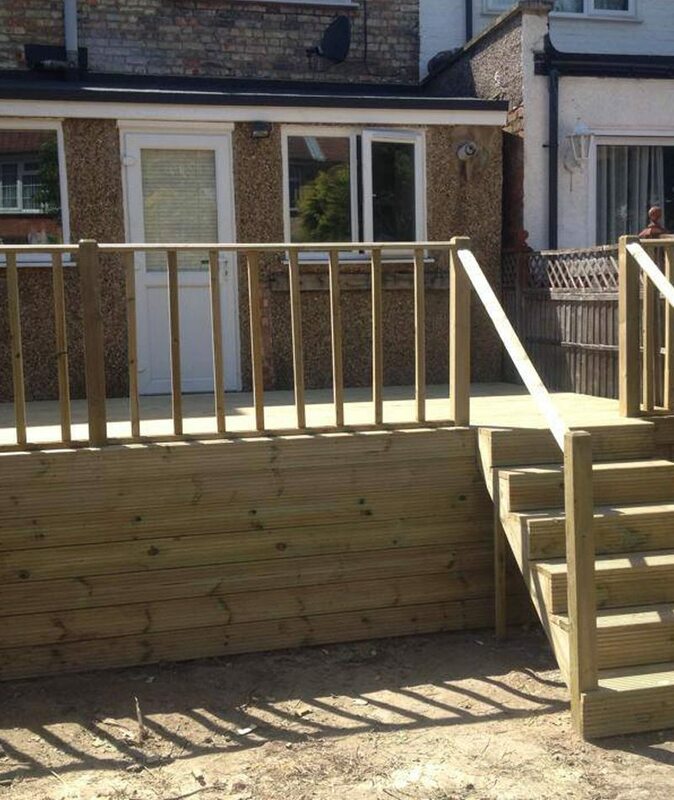 We also installed hand rails and spindles due to the large drop off, we then installed a staircase from the decking area down to the main garden.